Version 6 of Pianoteq brings numerous refinements in its engine and physical model, now implemented in all of the 52 physically modelled instruments. This major upgrade also adds compatibility with the VST3 format (in addition to VST2 format) and the ARM architecture (Linux version only, for example on Raspberry Pi 3 boards). The tuning section has become even more advanced with new tools, and the standalone version now offers a MIDI playlist, an improved MIDI archive and can export audio to FLAC and MP3 formats, in addition to WAV. 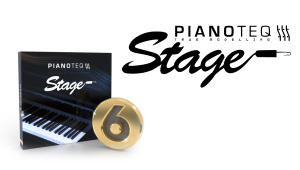 Pianoteq 6 Stage is the choice of the budget-minded musician who does not need to modify the sound. Pianoteq Stage includes the same instruments, sounds and playability as in Pianoteq Standard and PRO. You can upgrade to the Standard or PRO version at any time. 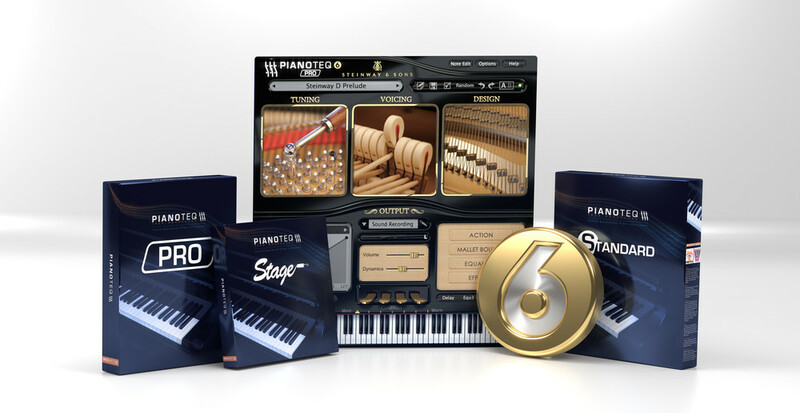 Pianoteq Stage comes with two instrument packs of your choice. 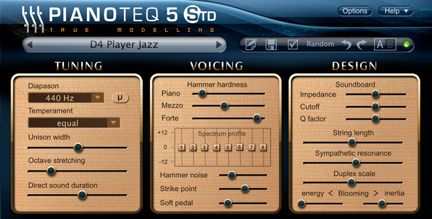 Pianoteq 6 Standard offers unique powerful tools to enhance and modify the sound, such as changing the unison width, hammer hardness and string length. You can place up to 5 virtual microphones around the instrument and load external reverb impulse files. You can upgrade to the PRO version at any time. 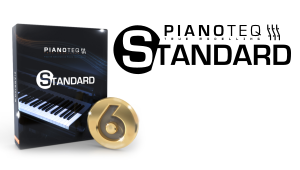 Pianoteq Standard comes with three instrument packs of your choice. 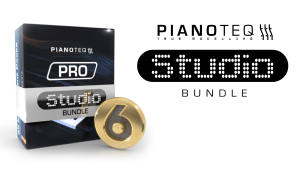 Pianoteq 6 PRO is the most advanced version, adapted for the creative composer and demanding studio engineer. In addition to the Standard version, it gives you all the tools needed to work in a truly professional environment, letting you adjust 30 parameters for each note on the keyboard and work with up to 192 Khz audio. 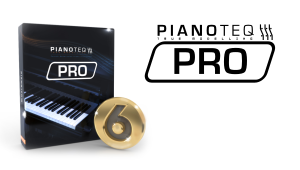 Pianoteq PRO comes with four instrument packs of your choice. All versions offer the same sound and playability but differ in the range of features and settings. Version 6 of Pianoteq brings numerous refinements in its engine and physical model, increasing realism and acoustic presence on all its modelled instruments: acoustic pianos, electro-acoustic pianos, historical instruments and chromatic percussions. Pianoteq becomes, more than ever, an immense joy to play. Pianoteq 6 facilitates your workflow by adding compatibility with the VST3 format and the ARM architecture (Linux version only, for example on Raspberry Pi 3 boards). VST3 is the latest plug-in platform developed by Steinberg, and is supported by many audio hosts. Compatibility with the ARM architecture means that Pianoteq 6 can be used with RISC based CPU's used in smaller Linux based consumer electronic devices. Furthermore, since Pianoteq 6.1, the NKS (Native Kontrol Standard) extended plug-in format from Native Instruments is supported. In the Pianoteq Standard and Pro versions, the tuning section has become even more advanced with new tools, adapted for those of you who are into microtuning and other tuning experiments. The standalone version now offers a MIDI playlist and an improved MIDI archive. You can load a set of MIDI files to be played back, like a jukebox. Everything you play on your keyboard is automatically recorded in MIDI format, now archived and accessible as multiple MIDI files. No need to worry about a performance lost, you can easily find it again. The MIDI mapping in Pianoteq 6 now adds the option to save locally (current preset) or globally (all presets). Besides the WAV format, you can now export your audio files in the lossless compressed format FLAC and the lossy compressed format MP3. This will save you some time and effort, bypassing the need to do audio conversion afterwards. In the standalone version, the virtual keyboard displays keys in colour when you depress them on your keyboard. You can thus more easily see what you and others play, useful for piano practice. Chords are also detected and displayed. Vivid The piano creates the sound in real time while you are playing and takes into account all the complex factors that makes the piano a truly vivid instrument, such as the interaction between strings, the use of pedals, the cabinet resonance and the position of the hammers. It will feel like you have a real piano in front of you... as if you could just lean over and touch the strings! Versatile Pianoteq introduces new methods to adjust the piano sound to just the way you like it! Changes that until now could only be made by piano tuners are now possible directly from the interface. Within seconds you can adjust the sound to a particular type of music or playing style. The many choices can be saved as a customized setting which you can share with other Pianoteq users. Expressive All the detailed variations of the timbre are there, from the weakest pianissimo to the strongest fortissimo! What you express on your keyboard will also be what you actually hear. The sound of even the weakest pianissimo is absolutely pure without any audible quantization noise. Convenient Conveniently for the travelling musician, Pianoteq runs well on a modern laptop. Pianoteq loads quickly because of the extremely small size (less than 50 MB). We present here the main Pianoteq sound features that illustrate the great flexibility but also the beautiful sounds offered by physical modelling. 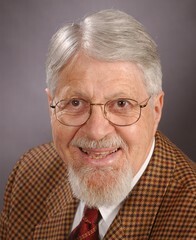 Many of these features are unique and original inventions by MODARTT. Sympathetic resonance When undamped strings respond to other string vibrations, it results in sympathetic resonance, here slightly exaggerated and revealing a silently depressed chord C2-E2-G2-Bb2. Sustain pedal resonance Listen to how the sympathetic resonance of all strings brings vividness to the piano sound. Here the sustain pedal is depressed during the whole sequence. Duplex scale resonance In an acoustic piano there are undamped string parts, called duplex scales, which come into resonance. In this example (exaggerated) staccatos are revealing these duplex scales. Sound variation in repetition Repeated notes show a variation in sound as the hammer strikes the strings differently when they are in motion. Pianoteq reproduces this effect demonstrated here. Buzzing in the bass Strong strokes on the copper-wounded bass strings produce an irregular buzzing sound. Sustain pedal off/on We listen here alternatively to the sustain pedal off/on. When pressing down the sustain pedal of an acoustic piano, the dampers are lifted, resulting in a sympathetic resonance of all the strings. Pedal catch/repedalling When the dampers come back in contact with the strings, the string vibrations do not stop immediately. If the sustain pedal is depressed a very short time after, which is called pedal catch (or repedalling if done several times), then the strings are still vibrating a little. Partial pedal If you depress the sustain pedal only partially on an acoustic piano, the dampers will stay partially in contact with the strings. The vibrations are then partially damped. This is called partial pedalling (also known as half pedalling). Digital pianos which are equipped with a progressive (continuous) sustain pedal, can achieve the same effect with Pianoteq. Unison detuning (large) The unison width adjusts the frequency variation within each unison, changing sound character. Greatly increased, it produces the honky tonk sound ('U4 Honky Tonk' preset). Unison detuning (small) With a smaller detuning, you can hear some slow beatings between the strings. Increasing here the unison width progressively to 1, 2, 3. Temperament The temperament has not always been equal. Here equal temperament (first) is compared to Werckmeister III temperament on the Walter pianoforte. Voicing Important changes can be made to the sound by changing the hammer hardness. This example demonstrates soft, medium and hard hammers. Overtones Changing the weight of each overtone can produce some dramatic changes as illustrated by this example. Hammer noise The hammer noise can be adjusted separately, softer and then stronger in this example. Una Corda (soft) pedal Comparison without vs. with soft pedal. Modification in phase and direct/after sound contributions in each unison induces subtle changes in the sound. Soundboard impedance The soundboard impedance is related to its dimension (thickness, width) as well as to the quality of the wood (elasticity, weight). It has a great influence on the sound duration. Here default impedance followed by higher impedance. String length The inharmonicity of a string varies with its length (and also with its diameter, tension and material). We listen to a virtual piano of size 1.60 m, then 2.7 m, and finally 10 m.
Extended range Some of the Pianoteq virtual grand pianos (D4, K1, C3,...) offer an extended keyboard range of 105 keys, down to A-2 and up to F7 (normal range is from A-1 to C7). Strike point In instruments like cimbalom, vibraphone, xylophone, etc., the strike point is controlled by the musician, contrarily to the piano where it is fixed by the manufacturer. We illustrate here how Pianoteq allows this control taking as example the cimbalom, ancestor of the piano. First 'normal' position, then one third of the string length. Mallet bounce The mallet bounce effect can be used with the cimbalom as illustrated here, as well as with any other Pianoteq instrument. Pickup symmetry In an electro-acoustic piano, the pickup is not exactly in front of the tone source at rest. When it is exactly in front, due to the symmetry of the device, the note jumps one octave higher. Here we listen to normal position, then almost symmetric position (slider at 0.8). Pickup distance When the pickup is moved closer to the tone source, the sound becomes more distorted and the timbre variation between soft and loud sounds increases. We listen to a normal and then to a closer position. Clavinet pickups The clavinet contains two sets of pickups, positioned above and below the strings. We listen here to the four standard configurations of these pickups: AC, BC, AD, BD. Wah-wah Wah-wah is a very spectacular effect, auto-wah used here with the clavinet. Tremolo The tremolo is commonly used on vibraphones and electric pianos. Demonstrated here with the Vintage Tines. Chorus and flanger Various presets of chorus and flanger are illustrated in this short piece. Switching from one preset to another produces sometimes some interesting sounds too. Combo amp A combo amp is included in the effects section. An overdriven amp is demonstrated here. Pitch bend The sound can be altered using pitch control, creating variable glissandos in real time. The bend range can be adjusted up to +/-600 cents. Convolution reverb Pianoteq is equipped with a convolution reverb. Three examples: 'Clean Studio', 'Large Hall', and finally the extreme and impressive 'Taj Mahal'. Effect demonstration Here is a demonstration of how powerful and flexible Pianoteq can be in the hands of a sound designer. Created exclusively with a heavily edited Pianoteq Concert Harp in Pianoteq Pro, using mainly Pianoteq's built-in effects. Free instruments: KIViR historical instruments collection, bells and carillons. Effects: Tremolo, Wah, Chorus, Flanger, Phaser, Fuzz, Delay, Amp, Compressor, Mini-eq. Renders high resolution MIDI formats CC#88 and Disklavier XP. More instruments can be purchased separately, at any time. As a Pianoteq customer, you also have access to a set of free instruments: historical, bells and Pianoteq presets (FXP files). The Pianoteq physical model was issued from academic research at the Institute of Mathematics of Toulouse, INSA, Toulouse, France and is continuously developed by Modartt. The result is what we call the fourth piano generation. Pianoteq is the very first piano that belongs to this generation. The first generation of pianos began with Cristofori's pianoforte in 1698 which came to maturity at the end of the 19th century with the acoustic grand pianos. It was followed in the 20th century by the second generation electro-acoustic pianos and the third generation sampled pianos where each note is a recording of how it sounded during a specific moment in time, not taking into account the complexity of the instrument. Pianoteq is the first piano belonging to the fourth generation, developed in order to go beyond the limitations of the third generation and to become a versatile and innovating tool. It is in fact the first virtual piano factory — it can produce new brands as well as copies of historical instruments. "I demonstrated the first "Piano from first principles" at a conference in Austria in 1980. Never in a million years would I have dreamed at that time that, in my lifetime, this art would have reached the state of development embodied in your Pianoteq program. I congratulate you and all your collaborators on this most marvelous development." Progressive sustain pedal, allowing the so-called “half pedal”, but also quarter or tenth’s pedals if you want! Lute pedal, where a wooden bar covered with felt is pressed against the strings, shortening the duration of the sound. It can be found in some historical pianos. Various effects including equalizer, keyboard velocity setting, volume, sound dynamics which controls the loudness levels between pianissimo and fortissimo, reverberation with control of reverberation weight, duration and room size, limiter, tremolo. The very best sampled pianos of today are the result of many hours of careful recordings associated with complex solutions designed to provide a valuable piano sound. We respect the work of these high class competitors who manage to develop sampled based pianos of this quality. However, as is well-known, sampling technology itself has inherent disadvantages. The sampled piano contains static recordings of each note, how it sounded during a particular moment in time. It does not take into account the influence of other strings vibrating, cabinet resonance, pedal interaction and hammer position. The sampled piano cannot alter the existing piano samples when it comes to parameters such as hammer hardness, unison tuning, cabinet size, overtones spectrum etc. The sampled piano has several technical limitations such as audible quantization noise and uneven variation of the timbre (from ppp to fff). Despite many recent attempts to enhance the sampled piano sound by adding convolution reverb and other post processing effects, the technology as such has too many limitations when it comes to achieving a truly vivid and convincing piano sound. Vivid: The piano creates the sound in real time while you are playing and takes into account all the complex factors that makes the piano a truly vivid instrument, such as the interaction between strings, the use of pedals, the cabinet resonance and the position of the hammers. It will feel like you have a real piano in front of you... as if you could just lean over and touch the strings! Versatile: Pianoteq introduces new possibilities to adjust the piano sound just the way you like it! Things that until now were dedicated for piano tuners are now possible directly from the interface. Within seconds you can adjust the sound to a particular type of music or playing style. The many choices can be saved as a customized setting which you can share with other Pianoteq users. Expressive: All the detailed variations of the timbre are there, from the weakest pianissimo to the strongest fortissimo! What you express on your keyboard will also be what you actually hear. The sound of even the weakest pianissimo is absolutely pure without any audible quantization noise. Convenient: Thanks to its rather modest system requirements, Pianoteq is suitable to run on a modern laptop, convenient for the travelling musician. The small size (less than 50 MB) and the fast interface means no loading time. Just a few mouse movements to start playing. The many adjustable parameters make it possible to not only adapt the existing piano model but also to create new piano sounds. This is one of the advantages of a truly modelled piano — it opens up new possibilities for the creative musician. 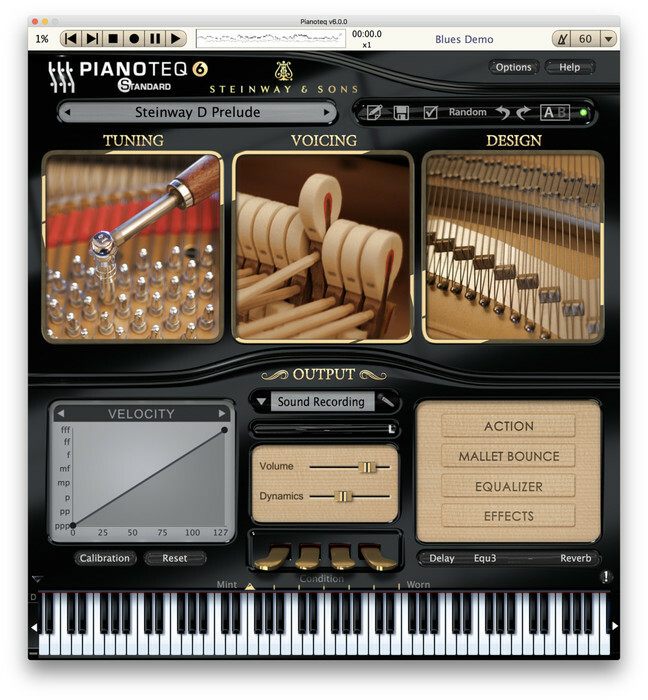 Pianoteq lets you improve the tuning in ways that are usually available only to piano tuners. 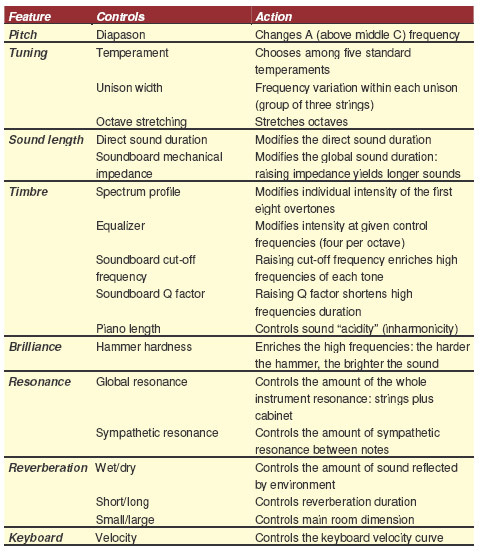 Example: diapason (414-467 Hz), different kinds of temperaments (from equal to well tempered), microtuning, unison tuning (for changing the timbre or colour of the sound), octave stretching and direct sound duration. Another task for a professional piano tuner is to "shape" the piano sound according to the pianist's taste. By adjusting hammer hardness it is possible to adapt the piano sound from mellow to bright in great detail. There is not just one adjustment, mellow to bright, but a very detailed slider for each major velocity: pianissimo, mezzoforte and fortissimo. The next feature is something that not even a piano tuner can do — changing the soundboard impedance. You will get a total control of overtones. This makes it even possible to change the size of the piano, from A size to D size, even up to a 10 meter (33 feet) grand! To provide you with more possibilities in one package there is also a graphical equalizer and a reverb unit. Of course you can bypass any of these if you prefer other effects plug-ins. You can also in detail adjust the velocity curve for your particular keyboard to ensure that you get the expression that suits you the best. It can be used as a stand-alone player and with any VST3 or Audio Units host such as Cubase, Logic, Nuendo... Please refer to the FAQ page for more details. The Pianoteq Steinway D and K2 virtual grand pianos offer an extended keyboard range of 105 keys. This range makes it the largest ever available in a piano. Grand pianos that offer an expanded keyboard range are rare and extremely expensive. A very well-known example of such a high class instrument is the Bösendorfer Imperial Grand, with its 97 keys expanding the bass range. Stuart & Sons have also built innovative 102 keys pianos, increasing both the bass and the treble range of the piano. MODARTT takes up the challenge by providing an unprecedented extra-large key range for its Steinway D and K2 virtual grand pianos, with no less than 105 keys (17 keys more than the standard keyboard range), ranging from ultra-low rumbling bass to very high bird-like pitches. The keyboard range expansion was developed to correspond to an increasing demand from Pianoteq users for additional notes. The extended sound palette, obtained thanks to the powerful Pianoteq physical modelling, can be used e.g. in certain prominent piano works by Debussy, Ravel and Bártok where the extended range is utilized. If playing gentle octave chords, the extended bass notes will add a rumbling sound that will strengthen the effect. Below is an example of where the pianist makes use of the extended keyboard range. In this particular arrangement (suitable for 4 hands), Pianoteq demonstrates its capacity where most other pianos will fail. Based on transcriptions of Paganini's last movement of his second Violin Concerto, Pianoteq's extended keyboard range brings out the complete tonal colour palette. The highest D#, which constitutes Paganini's original 'La Campanella' (The Bell), exists in an octave higher than every other commercial piano library in the world. Many rumbling ultra-low octave notes are also prominently featured. Fixed a bug with the MIDI recorder (random crash). The linux executable is no more PIE as some Linux file managers do not recognize PIE files as executables. New instrument: the C. Bechstein Digital Grand. Revoicing of grand pianos Steinway D, Steinway B and K2. The VST3 plugin is now able to take into account the "tuning" parameter of VST3 note events (useful for users of alternative tunings in Dorico). When navigating in the MIDI sequence, Pianoteq will restore the position of the pedals. SysEx messages are now kept in midi files when saving (instead of being removed). The metronome tic toc sound has been slightly changed. The tempo / time signature of the metronome is now embedded in midi files recorded with Pianoteq. When using external reverb impulses, Pianoteq will store (if possible) the path of the WAV file relative to the Pianoteq presets folder, or to the user home folder. Fixed issue in the attack of some notes at low velocities. New instrument: the ANT. PETROF grand piano. (2018/09/27) Fixed crash when loaded as a plugin. Workaround for the AU plugin in Studio One 4. Improve the detection of true-stereo impulse files. The VST3 can now load with 5 channels in REAPER. Fixed wrong positioning of labels in the presets manager. Small adjustment to the Blüthner Grand, making the sound a bit less wet. Fix for the 'Buff stop' pedal and the 'Mute' slider, which were broken in v6.2.0. New instrument: the Steingraeber E-272. New pedal: the Mozart rail. Minor revoicing of all grand pianos. Pianissimo behaviour improved for all grand pianos. The preset manager can now be resized (when detached from the main window). On Windows and Linux, the main menu is automatically hidden in fullscreen mode. (2018/06/14) Fixed an issue of the trial version that could sometimes produce a loud noise on first note played. The soundcard 'auto-restart' feature should be working again. The Perf panel of the options dialog has been updated to display the real-time cpu performance index. New spatialisation technique which brings more air and presence to the instruments, increasing realism. Minor re-voicing on some instruments/presets. Support for the NKS (Native Kontrol Standard) extended plug-in format from Native Instruments. The most recently used presets (up to 5) are displayed in the presets menu. The loudness should be more even when the reverb amount is changed. The issue where an unavailable soundcard would sometimes freeze the interface on startup should be fixed. An old issue where sometimes a parameter change would fail to apply has been solved. (2017/11/02) updated the STAGE version in order to fix an issue with non-global midimappings. (2018/01/17) Better handling of multitouch events for the graphical keyboard. (2018/01/17) Fix automation of pedals, and diapason. (2018/01/17) Fix issue where sympathetic resonnance was not working with the --multicore max option on Linux. (2018/01/17) Added command-line options --midi-channel and --midi-transpose to the standalone version. The VST3 plugin should now be listed next to the old 'Pianoteq 5' vst2 plugin in Cubase, instead of being in the 'Synth' folder. The issue with the VST3 plugin on Dorico has been fixed (simultaneous 'All Notes Off' and 'Note On' events). Fixed malfunctioning random button in the spectrum profile note edit. Allow larger ratios to be recognized in the microtuning component. The command-line export of large MIDI files on macos is fixed. A workaround for the AVIRA false positive malware warning has been found. Fixed an issue where the presets saved with the STAGE version would sound different when reloaded. Add an option to disable the chord detector (in options / general). Fixed stuck tremolo issue when the depth was brought to zero. Partial fix to the issue where touchscreens do not work with Pianoteq 6 popup menus. Partial fix to the issue where the LV2 plugin window would not resize correctly. Fixed issue where the Pianoteq STD AudioUnit would sometimes refuse to load in Ableton Live . Fixed issue where the Pianoteq VST3 would produce a buzzing sound in Dorico. All 49 instruments available in Pianoteq have been overhauled (the pianos, EPs, percussions, etc, including KIVIR). VST3 plugin format support has been added (plugin formats supported in Pianoteq 6: VST2, VST3, AU, AAX (64-bit), LV2). A MIDI playlist is now available. The MIDI auto-recording and archiving is improved and more configurable. The MIDI Mappings feature is more configurable -- MIDI Mapping can now be either global, or preset specific. Audio export in MP3 or FLAC format has been added. New tuning tool (available in Pianoteq Std and Pro only). A simple chord detector has been added. The Linux version is now available for ARM architectures. Fixed issue with audio glitches when changing parameters on some presets (electric pianos in stereo mode). Small improvement of the ALSA output latency on Linux. New instrument: the Grotrian Concert Royal grand piano, authorized by Grotrian. New effects presets, by K.P. Rausch. Pianoteq can now open MIDI and FXP files from the 'Open With' contextual menu of the MacOS Finder and Windows explorer. New instrument: the electric piano "MKII", included in the "Electric" instrument pack. For consistency, the "R2" instrument has been renamed to "MKI". The dampers algorithm has been revisited (all instruments), improving their behaviour for fast successions of Note-On/Note-Off. Fixed a sustain pedal bug in the trial version. Added missing parameters in the midimappings menu (harpsichords registers switches). Fixed pictures and some labels in the harpsichord voicing/tuning/design panels of Pianoteq STD/PRO. New instrument: the Ruckers Harpsichord, with its 3 registers. The 'lute stop' pedal has been renamed as 'buff stop'. Its sound has been largely improved. The control nodes in the velocity / equalizer editor can now be moved with the keyboard arrows. The linux lv2 plugin version has been brought up-to-date (no more deprecated extensions). Support for multichannel keyboard mappings has been introduced in Pianoteq std/pro, allowing full keyboard range on scales with up to 128 notes per octave, with keyboards such as terpstrakeyboard. Correction of a minor resonance bug for the piano instruments. Clavinet and clavichord: better behaviour of the pitch variation on note attacks. New instrument: the Model B Grand Piano. Fixed incorrect plugin window size when the graphical keyboard was hidden. Fixed issue with some reverb impulses that could not be loaded. Fixed crash with the Pianet when some combination of parameters is used. Fixed GUI being wrongly displaced by the random button. New instrument added in the Hohner collection: the Pianet N.
A fuzz effect has been added. In the standalone version, it is now possible to delete parts of the MIDI sequence loaded (right click on the sequence). Fixed issues with the attachment of a midimapping to a specific preset. New instrument: the Concert Harp. New pedals: glissando and pinch harmonics. Diatonic mode switch for the keyboard (the small 'D' button on the left of the graphical keyboard). New effect: the 3-band parametric equalizer. Copy/paste of all notes now available in the spectrum profile editor (Pianoteq Pro only). Fixed an issue with excessive CPU usage. Fixed the pickup sliders for the Hohner instruments. The Clavinet instrument pack becomes the Hohner collection including two new instruments: the Pianet T and the Electra. A phaser effect has been added. Added an "ignore the sustain pedal" switch for the sostenuto pedal. The wav export settings are now recalled. Fixed engine issue when running at 192kHz. D4 Grand update: una corda model revisited, slight revoicing, in particular from ppp to p.
New instrument: the Toy Piano. Small update to Bluethner (revoicing, mainly in the upper range). Fixed an unexpectedly low output volume on some instruments (electric pianos) when stereo or mono output mode is selected and multicore rendering is disabled. Fixed a rare crash involving simultaneous notes and bad luck. Fixed an issue with the AAX version on OSX. KIViR collection brought up-to-date with Pianoteq 5. Binaural model improved for all instruments. Extended keyboard range switch available in the interface. Small updates to D4, K2 (lowered a few longitudinal modes) and Bluethner (voicing). Fixed issue with the AU plugin that was not recognized by a few hosts (STAGE version only). Metronome fixes (1/1 time signature begin silent, accent on first not being recalled). Velocity curve fixed to allow silent notes. Supersostenu was missing from the list of midi-assignable parameters. All instruments brought up-to-date with latest model improvements, D4 and YC5 re-built from scratch. Nine new instruments: Grand K2 and the Kremsegg Collection. The free KIVIR instruments are still those of version 4, but we are working on them and a very improved version will be available soon. Stay tuned. Directional microphones support, which can be rotated in all directions. Many microphone models, with various directivity patterns, are available. Microphones can be linked together, and then moved or rotated together. The polarity of a microphone can be reversed (for M/S recording situations, typically). The four pedals of the interface can be re-assigned to a few parameters such as Rattle, Lute Stop, Celeste, Super Sostenuto. Improved key noises, with an optional humanization of the parameters. Pianoteq presets (FXP files) can now embed a short MIDI excerpt. Dithering added to the audio export in Pianoteq Standalone. Fix the incorrect aftertouch velocity curve for the W1 electric piano presets. Fixed crash with Tracktion 5 on mac. (2014/04/17) Fix for the documentation that would not open in the 'help' menu. Workaround for an issue with Maschine 2.0 (crash when loading the VST plugin). Fixed bug of STAGE version where a wrong mic configuration could be sometimes selected after loading a reverb preset. Fixed sostenuto pedal behaviour when the sustain pedal is engaged. Handling of scala KBM files with more than one occurence of the same note is fixed. (2013/11/21) Fix for interface freezes and keyboard issues of the VST plugin with Ableton Live (on Windows). (2014/01/15) The electric pianos have been renamed as "Vintage Tines R2" and "Vintage Reeds W1". Fixed an issue with CoreAudio on MacOS X 10.9 (Mavericks), where Pianoteq would sometimes freeze on startup. Fixed a crash that happened on some specific conditions (typically Pro Tools with a buffer size set to 1024, for some presets). Pianoteq is now available as an AAX plugin for Pro Tools 11. French translation of tooltips available. The condition slider is correctly saved and restored in Pianoteq STAGE. (2013/10/07) Fixed a crash occuring on some instruments when the damping duration was set to a very high value. Fixed a crash in the delay effect. Fixed issue where the ASIO sample rate was not correctly restored on startup. Bluethner picture is back in the preset window. (2013/04/16) fixed crash with midi automation of some sliders. (2013/04/16) fixed U4 wall being dragged out of reach. New add-on instrument: the upright piano U4. The others grand pianos benefit from model improvements: D4, K1, YC5 and Bluethner have been updated and improved. New 'Condition' parameter: turn a perfect instrument into a worn out, detuned and broken instrument, with a single click. New 'Unison Balance' parameter (available in Note-Edit with Pro version, and via right-click on the unison slider in Pianoteq Standard). Linux version is now also available as a LV2 plugin. New instrument in the KIViR collection: the Neupert clavichord. Pianoteq now has a velocity curve for the aftertouch (polyphonic AT and channel pressure). The graphical keyboard of the interface can also trigger aftertouch messages by clicking a key and dragging the cursor up and down. New optional add-on instrument: The Bluethner Model 1. The electric piano R1 has been replaced by its successor, the R2. The old R1 presets have been moved in a legacy add-on. New parameter for R1: tines sound. (2012/07/13) Fixed crash with some VST hosts. (2012/07/13) Fixed behaviour of the delay polarity switch when controlled by MIDI messages. (2012/08/23) Fixed regression in the pedal noises. Performance issue with effects fixed. Fixed a bug where custom effect presets were not being enabled when loaded. Fixed automation issues of the STAGE version with some parameters. The windows version now releases the audio/midi device when the computer is being suspended. The windows version correctly shuts down when the computer is being turned off. Slow WAV export in the standalone version fixed. The panic button also resets the midi connections when clicked. The 'no audio device' dialog has been improved. Better behaviour with low velocity repeated notes when the sustain pedal is used. Added 'clear menu' entries in the recent MIDI files menu. Added a '--midimapping' command-line option. (2012/06/18) Fixed random crash on startup. Renamed Pianoteq PLAY to Pianoteq STAGE. Fixed issue with some realtime MIDI messages (MIDI clock etc) on Macos. Undo/redo behaviour when a slider is being dragged should now be really fixed.. Fixed magnification issue with the spectrum profile note-edit. Disabled multicore rendering for Pro Tools in order to avoid freezes. Grand K1: correction for an unwanted difference with the K1 of Pianoteq 3. Standalone version: single-step through midi files using the left/right arrows of the keyboard. Allow drag&drop of impulse response WAV files for the reverb. Improve diagnostic message when an external impulse response is not available. Fix issue with some midimappings not working on startup. Better undo/redo behaviour when a slider is being dragged. Do not truncate exported WAV files when the sound tail is long. Linux version: handle SIGUSR1 nicely. Linux version: solve incompatibility issues with realtime kernel variants. Fixed a random crash happening in VST hosts when switching effects. Fixed a few issues on Linux (wrong MIDI port name, crash when detaching windows with xmonad). New Grand D4 instrument, with an improved soundboard and sound radiation model. New set of effects, including a convolution reverb. Fixed a bounce issue with Logic 9.1.6. The pianoteq VST dll is now autonomous, it does not depend anymore on the pianoteq standalone executable. Native VST for the Linux version. Fixed an issue with the trial versions. Add a "MIDI Dialect" option for high resolution MIDI messages: The "Disklavier XP" mode enables the recognition of "extended precision" midi files recorded on high-end Disklavier pianos, such as the ones available on the international e-piano competition website. The "Hi-res CC#88" mode enables recognition of the MIDI high resolution velocity prefix for note-on and note-off messages, such as the ones sent by the VAX77 MIDI keyboard. Key range of K1 and C3 grand piano extended to 105 keys. Keyboard transposition can be controlled with the computer keyboard, or custom MIDI mappings. 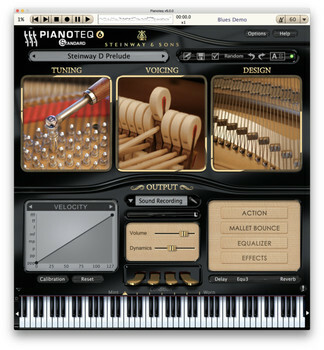 Pianoteq Standalone now recalls both A and B presets on startup. (2010/10/25) fixed issue with Gamelan.fxp. (2010/10/25) fixed activation issue on windows. New Xylo add-on, featuring Xylophone & Bass Marimba. Added drag and drop for microtonal Scala files on the Pianoteq interface. Fixed an occasional crash of repeated notes with some velocity curves. Introducing the Celesta and Glockenspiel instruments. Added a humanize option to the Strike Position slider (right click on the slider). The Mac version now includes a 64-bit version of the standalone application and the Audio-Unit plugin. The preset menu was reorganized. Fixed issue with multi-channel pitch-bend messages when used for microtuning purposes (with devices such as http://www.h-pi.com/ ). New K1 Grand Piano instrument. User selectable folder for user presets and add-ons. The default MIDI file for the standalone version can now be changed. Jack MIDI support for the Linux version. Increased the filter sweep speed for the wah-wah effect. Updated engine and interface for the new Clavinet add-on. New "Mute" parameter in the actions panel. Added a Wah-Wah effect section. 29400Hz is now available as an internal sample rate in the options/perf panel (provides excellent sound quality with lower cpu usage). Improved the audio load curve, and added a warning in the options/perf panel for suboptimal buffer sizes. Various optimizations for netbooks, Pianoteq 3.5.3 runs smoothly on an atom N280 netbook when using an internal sample rate of 29400Hz. Updated engine for the new Cimbalom add-on. (2009/12/16) Fixed a crash of the RTAS version. Fixed VST-specific bug when loading old projects or FXB files in the VST plugin. Fixed crash when loading some custom keyboard mappings. Slightly improved performance of multicore-rendering on windows. Minor adjustement of the damper model. KIViR.ptq also updated. Engine upgrade, with improved resonances, for all instruments. C3 and M3 pianos have been revoiced, and their soundboard replaced. Small improvements on the electric pianos, a new preset R1 Bark has been introduced. The KIViR historical instruments have been updated (small improvements). Note Edit for DETUNE and VOLUME in Pianoteq Standard. Note Edit for other parameters in PRO version. Note Edit, Sound Recording, and Preset Manager window can be detached from the main interface. Added a note-off velocity curve, and a sustain pedal position curve. New parameters available for most instruments: (hammer) Strike Point, and Damper Position. Adjustable playback speed for the standalone midi player, adjustable volume for the metronome. The compare button has been replaced by an A/B button, for switching between two presets. Pitch bend range extended to +- 2400 cents. Direct Sound behaviour improved with respect to Unison Width and Soundboard Impedance. Added 'Rock Piano' optional add-on. Fixed a crash when using pitch bend as a VST parameter. Reduced the default tremolo rate for Electric R1. Native Linux (x86) version now available, with Jack and ALSA backends. Auxiliary output buses available for the AudioUnit version. (2009/05/18) A few fixes for the Linux version. Minor modifications to the C3 instrument sound: more punch in fortissimo, slightly longer notes and slightly longer harp resonance. Auxiliary channels available for Pro Tools. Performance improvements for G5 cpus. (2009/03/20) Fixed some random "lag" issues with Logic / Garageband 5 / Pro Tools on Mac. known issue: there is a 'mouse offset' bug with Pro Tools on Mac. When this bug occurs, a workaround is to move the mouse cursor over the bottom of Pianoteq interface.